A new government consultation wants feedback on how we fund sustainable energy in Ireland. 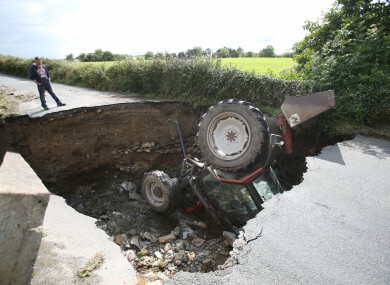 A FEW WEEKS ago, “once-in-a-lifetime” flooding struck the north-west of Ireland. Serving as an effective reminder of the tangible effects of climate change, the scenes of the army helping the clean-up in Donegal have formed the backdrop to a new consultation launched this week by the Department of Communications, Climate Action and Environment. Entitled “Renewable Electricity Support Scheme (Ress) – Design Consultation”, it is asking what a scheme that would provide financial support to renewable electricity projects would look like. One of the challenges identified by the department with the scheme is that of funding, with many of the scenarios outlined in the consultation likely to make the PSO cost on each electricity bill higher. Speaking to TheJournal.ie, Irish Solar Energy Association CEO Michael McCarthy said that recent events in Donegal – and in Houston – bear an “inextricable link” to climate change and should act as a “wake-up call” for government. We have a moral obligation to the people of Donegal, and to the people of all those affected by floods in this country, to up our game in terms of climate change. This was echoed by Green Party leader Eamon Ryan who told TheJournal.ie that the party was “disappointed in the limited scope of what is being planned and the ongoing delay in taking real climate action”. According to the government, Ireland is committed to produce from renewable sources at least 16% of all energy consumed by 2020. It says that its target to have 40% of electricity consumed from renewable sources by 2020 is one of the most demanding in the world. Ireland, however, is one of only four currently in the European bloc that is expected to miss its 2020 goals, according to European Commission forecasts released this year. In launching the consultation, Minister Denis Naughten said: “The scale of the transformation needed to meet our low-carbon transition targets cannot be overstated. If we are to reach those targets, we must harness the combined efforts of the entire country. As well as industry, Naughten said that communities and other stakeholder groups are needed to make sure Ireland gets value for money, and sustainable solutions. “It is an approach that I believe will allow us to achieve our renewable electricity ambitions,” he said. This does not, however, include provisions for individuals to be in receipt of scheme funding for “micro and small-scale renewable generation”, which would include roof or ground-mounted solar panels. The consultation document has three main points for how it wants to expand renewable energy generation in the country. Using examples from countries like Denmark, Canada and Scotland it cites how local communities contribute to the low-carbon economy. In Denmark, it says that 35% of the country’s electricity comes from wind and a further 85% of that is owned by the residents of Danish communities. As well as looking at what works in other countries, the government also wants to diversify the “renewable energy mix”. It said that Ireland is “well placed to take advantage and greatly diversify its renewable portfolio” but that due to the high cost of some technologies, public opinion is required on how far we should go with this diversification. According to the Green Party, however, Ireland has been well-placed for such development for some time. Eamon Ryan said: “What we are seeing in Ireland is analysis paralysis here while other countries start to take real action. Ireland is falling behind in the deployment of large-scale solar power and offshore wind farms, where prices have fallen dramatically in recent years. The reality is that such big renewable power supplies no longer need public subsidies, if we can get the market rules and auction process right. One way of generating energy that is ruled out are people doing so on a very small-scale, like powering their own home. On this point, Ryan also disagreed. He said that it “makes sense” to support solar panels on people’s rooftops as it “restores ownership of power back to the people and promotes the efficient use of power at the place it is produced”. In the challenges to the scheme, the department admitted that the cost passed on to consumers has the potential to be an issue. The PSO levy is currently used to subsidise renewable energy sources in Ireland, and this could rise as a result of the proposals by government. It said: “The new support scheme will be funded by the PSO and paid for by all customers. Renewable electricity technologies are still more expensive than the market reference price for electricity. The PSO covers the ‘viability gap’ between the € each renewable generator needs to earn over its lifetime and what it will recover directly from the market. The PSO at the bottom of everyone’s electricity bill has been steadily rising in recent years. In 2011-12, the monthly levy was €1.61. Now, for 2017-18, it’s €7.69. With this new consultation, that has the potential to rise further. The consultation document said: “However, all the policies and recommendations will have a cost either to the electricity customer (through the Public Service Obligation (PSO)) or to the taxpayer. There is a balance to be struck since, depending on the level of ambition with regards to community renewable energy projects, the total costs could be significant. Dr David Connolly, head of policy at the Irish Wind Energy Association, said: “Price integrity for the consumer must be a significant factor in the next phase of Ireland’s renewable energy journey. The end-user, be they businesses or households across the country, are ultimately the ones impacted by energy costs and this must be a huge consideration in the new support scheme. McCarthy, however, said that any rise to PSO rates would be offset by the potential cost of EU sanctions against Ireland for failing to meet its renewable energy targets. In early 2016, former energy minister Alex White told the Dáil the cost of each percentage point shortfall “may be in the range of €100 million to €150 million” based on figures from the Sustainable Energy Authority of Ireland. McCarthy said: “Irish taxpayers will have to foot the bill if we fail here. And that’s a lot of money. If we miss it by 2%, that’s €300 million. That would dwarf any PSO increase. That’s more of an immediate concern. The Brussels clock is ticking. If we carry on like this to 2030, the so-called fiscal space would be wiped out by the Irish government’s inertia on renewable energy. Ryan added: “The next stage in our energy revolution has to involve a radical rethink of how the whole system works. With smart metering, solar power, offshore wind and greater interconnection we can develop a clean, competitive, efficient and secure electricity system. It is long past time for this solar revolution to begin. The public consultation closes on 3 November 2017. Email “'This and the Donegal floods go hand-in-hand': How Ireland plans to get to grips with renewable energy”. Feedback on “'This and the Donegal floods go hand-in-hand': How Ireland plans to get to grips with renewable energy”.